To dive straight into the deep art—Kaboom, nay, Bakoon—"the AMP-41 doesn't use the separate SATRI-IC boards. That core Bakoon circuit is implemented onto the main PCB directly. We don't use audiophile components like the 0.1% ultra precision resistors or top-line Shunyata hookup wiring of the AMP-51R. Also, the single pairs of smaller Exicon Mosfets, the same as in the AMP-12R, run without the dedicated driver stage of the AMP-51R's bigger Mosfets. The power supply too is scaled down by about 40% from the 100wpc AMP-51R and there are no copper bars. Still, we developed a new power circuit that runs more efficient, to obtain the performance we wanted. Since we're now waiting for the new, supposed to be final, 275VA Plitron transformers, we'll have to redo the output power tests. Also, the AMP-41 doesn't offer the mono input connection. Most of its parts are SMD types for automated soldering to reduce labour fees. Finally, the AMP-51R's CNC-machined remote controller is replaced by a plastic wand." That was Soo-In Chae of Bakoon riffing on their then-pending smaller amp whilst answering questions for my AMP-51R flagship review whose 'R' suffix designates 'reference' like our now discontinued 15wpc AMP-12R. For the sake of wit and soul, reference those prior reviews for more background. By August 15th, Soo-In checked back in. "I just returned from my trip to Kagoshima. We have finished the final AMP-41 tests. We actually managed to increase output power to 50wpc and to add a few upgrades over the last sample we'd made for the March audio show in Korea. We have a very limited number of early units but most of these are already reserved for those who pre-ordered during/after the show. Production is still limited by the Plitron custom transformer supply. About our unique AMP-51R/AMP-41 bias controller, we implement a separate constant-current source circuit for the output-stage bias. Now its Mosfets are always turned on. A similar concept was called 'super class A' or 'class AA' back when Sony and Technics tried to come up with new ideas. Our new circuit improves the bias stability of the output stage to a whole new level." Though a class A/B design, the AMP-41/51R output devices never turn off completely to never switch cold and avoid zero-crossing distortion. But unlike class A, they're not permanently turned on all the way either. It's an in-between state. Likewise for integrated status. All Bakoons use Akira Nagai's proprietary, ultra-wide bandwidth, current-mode and discrete IC. Its output resistor sets gain. Replacing that fixed resistor with a variable sort—via a high-quality pot for more affordable models, with a relay-switched resistor ladder for top efforts—transforms Bakoon amps into functional integrateds. But by changing amplification factor directly, their volume control solution is far more elegant than conventional approaches are. In fact, this scheme is related to Cees Ruijtenberg's variable reference voltage for his R2R Metrum DACs. Whilst in 2017, the AMP-41 was the firms entry-level or small amp, it's very much an esoteric affair, with circuit tech not found elsewhere. With most their products reviewed in these pages, the curious reader is once more encouraged to harvest our archives for the big picture. That unfolds the inevitable shorthand of today's intro. For now, think of Bakoon's AMP-41 as a remote-controlled 50-watt stereo integrated with two regular RCA inputs and two unconventional current-mode BNC inputs. Those recall Krell's CAST and B.M.C. 's current-injection interfaces. They require a Bakoon source like the DAC-21. Only that is fitted with the necessary 'send' terminals for cable-invariant current-mode signal transfer. And yes, for its power rating in an era of budget class D muscle amps, the AMP-41 is still priced very high. Yet it's less than half their all-out flagship. That should alert those who've lusted after sonic sat(o)ri for a lot less than $19'500*. Kaboon? Nay, Bakoon! 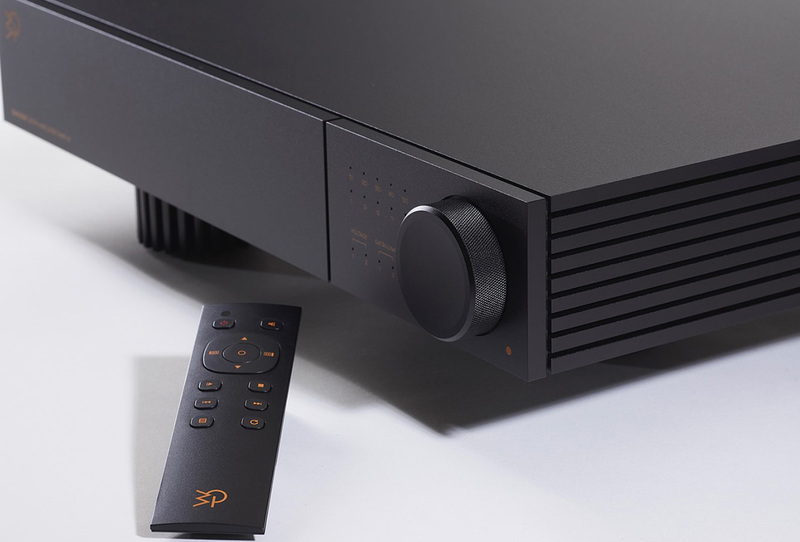 Or as Soo-In put it, "while compared to the AMP-51R the AMP-41 may read a bit inferior, it actually is a big step up from our previous generation of amplifiers. The AMP-51R is really the very best we can do and the no-compromise version of our amplifier platform. The AMP-41 is for those who want to enjoy most of our latest achievements at a far lower price. Again, we consider the AMP-41’s pricing very aggressive for its quality." * Those with an A+ in hifi history will remember. The AMP-11R upgraded to AMP-12R status (which, aside from circuit refinements, bumped power from 10wpc to 15wpc) sold for $5'995. It only had one each voltage/Satri input and no remote. Offering more than triple its power to be sufficient for the majority of applications, twice the i/o plus remote convenience, the AMP-41's sticker is actually very favourable within this exotic portfolio.